Download managers ensure we download files without interruption of network. You will agree with me it is quite frustrating to lose file half-way during downloads due to network interruption or sudden device shutdown. Android users and other smartphone users download their favorite TV series, music, applications on their device and sometimes could lose the download midway due to network interruption. I was a victim of this so many times that I imagined if I could use internet download manager on PC to download without interruptions or even resume my downloads anytime of my choice, why can’t I do same on my Android phone? So I decided to check out download managers for Android and found quite a good number of them. Some of them will even let you schedule your downloads, resume downloads in case of interruptions, download via WIFI to save your cellular data etc. So if you are an Android user and do not want to lose your downloads midway anymore, you need download manager for Android. Download managers for Android speeds up your download speed just like in PC, pause, stop and resume downloads in case of interruptions and can simultaneously download multiple files at a time. You can as well be notified of completed downloads. So let’s check out some download managers for Android. LoaderDroid download manager: LoaderDroid is my favorite download manager for Android, it is fast, stable and easy to use. Supports any file type for videos, images, music, applications etc. 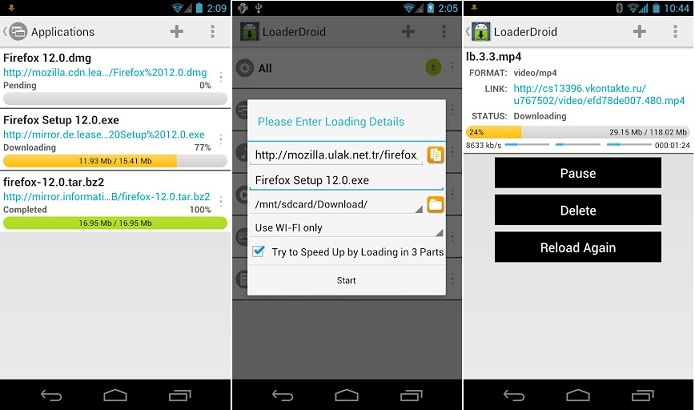 LoaderDroid has resume capacity, auto-pause when connection is lost, auto-resume when connection is re-established, intercepts links from browsers, can define which connection to download with (Wifi, 3G etc), downloads files by splitting them into smaller parts and repackages them on completion of download. Just like in PC, it can grab streaming links for download. Download Manager for Android: Download manager is yet another download manager for Android app that lets you manage all downloads from one location. Download manager for Android downloads files in parallel parts reusing connection to increase download speed, it also has resume capacities, and supports large file downloads of up to 2GB. Downloads can be initiated right from the browsers or be entering the download URL into the app directly. But one thing is it lacks is that it does not support media streaming like LoaderDroid above. Advanced Download Manager: Advanced download manager downloads files faster by using multithreading technique, can intercept links from browsers, saves different files in different folders, notifies on download completion, resumes download after disconnection. 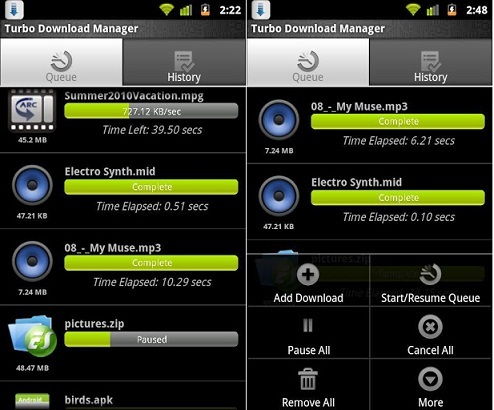 Turbo Download Manager: Turbo download manager is yet another download manager for Android with great features. Turbo download manager increase download speed up to 5x, there is no file size limit of this download manager, you can queue, pause, resume and even recover downloads, can download up to 10 parallel streams per download etc. Crystal Downloader: The Crystal Downloader is an awesome download manager for Android, it downloads quite fast, it can split a file up to 32 tinny parts and thus increasing your download speed up to 32x times, it has pause and resume capability and many more features. It has a very straight forward UI. Almost all download managers for Android works though this process. Most of them recognizes links on the webpage, so simply long click on the link to the file you want to download, and a pop up will ask you to share link or copy link location, you can share link and then choose your desired download manager for Android or copy link and paste directly in the download manager of your choice and start downloading. Now i hope you never lose another file during downloads, choose any of the top 5 download managers for Android and enjoy downloading on your Android smartphone. Do you know of other download managers for Android? Share with me using the comment form below. Remember to subscribe to my RSS feeds. Does My Business Need a Mobile App? Windows vs. Android vs. iOS tablets – which is the best for business operations? What is the perfect business smartphone OS? On anything about Android, I’m sold. Seriously, I’m becoming much and more addicted to Android apps since I started using Icecream Sandwich on my Tab. These download managers look promising. I’ll check them out tonight! I bet you will definitely love them…thanks for your comment. Android is the OS which is used in the smart phone to meet all the requirement of smart phone which is providing all the facilities which a computer and a laptop can give. Now there are so many application which helps to making business conversion easy through mobile phone only.